your free community and business advertising magazine. 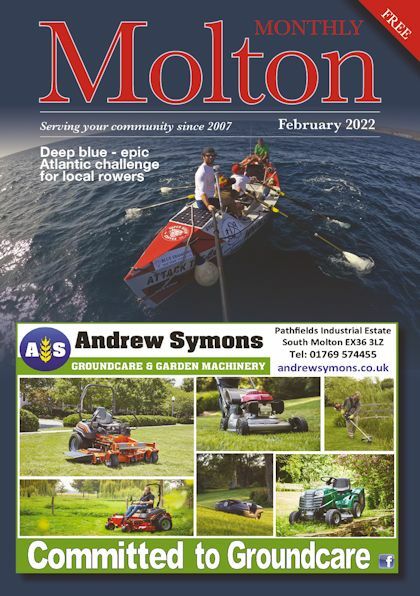 Molton Monthly is delivered free every month to almost 5,000 homes and businesses in South Molton & Pathfields, North Molton, Chittlehampton, Chulmleigh, West Buckland, Heasley Mill, Alswear, Bishop's Nympton, King’s Nympton, George Nympton, Queen's Nympton and surrounding communities - reaching an estimated 15,000 readers. It is also available to pick up at; The Amory Centre & Library, The Spar Shop, Griffin’s Yard, Quince Honey Farm, Rogers Garage, Sanders News and Devon Air Ambulance shop in South Molton; Swimbridge Jubilee Hall, Filleigh Village Hall, The Stag’s Head Filleigh, The Rising Sun and the Texaco petrol station in Umberleigh, The Jubilee Inn at West Anstey, The Red Lion in Chulmleigh, The Bell Inn at Chittlehampton, the Blackcock Inn and London Inn at Molland, the Poltimore Inn and Sportman's Inn at North Molton, the National Trust shop at Heddon Valley and the Mole Valley Farmers store at Pathfields Business Park. 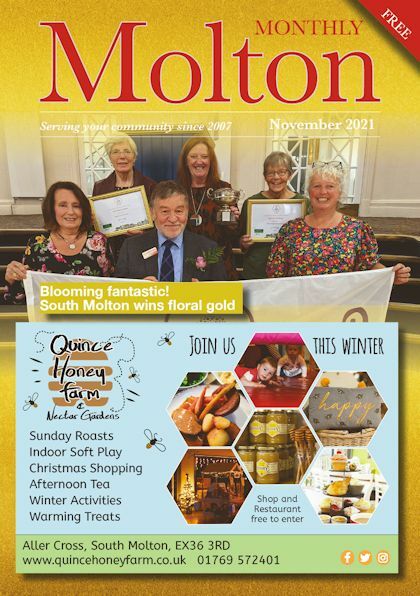 Here are the last six editions of Molton Monthly to read online. Please call or email for further details. We're not VAT registered, so the price you see is the price you pay. 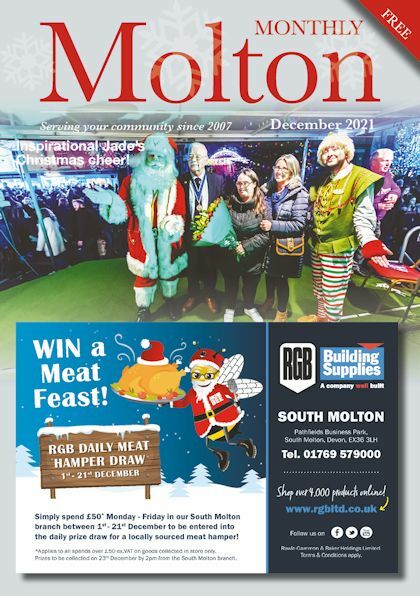 Molton Monthly is delivered FREE to more than 4,000 home and businesses in and around the South and North Molton area. Here at Molton Monthly we take your privacy seriously and will only use your personal information to administer your account and to provide you with the products and services you have requested from us. However, from time to time we would like to contact you personally by email or phone with details of relevant advertising and publishing services that we provide. By clicking CONTACT you are agreeing to these terms. 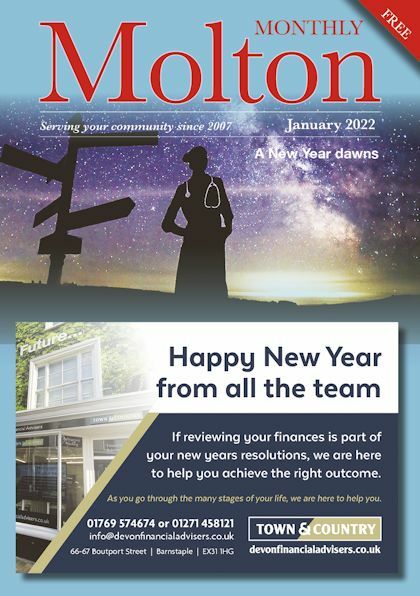 Molton Monthly will NEVER pass your details on to any other individual/company/organisation, and we promise only to contact with something specific to you - we don't do bulk mail-outs! 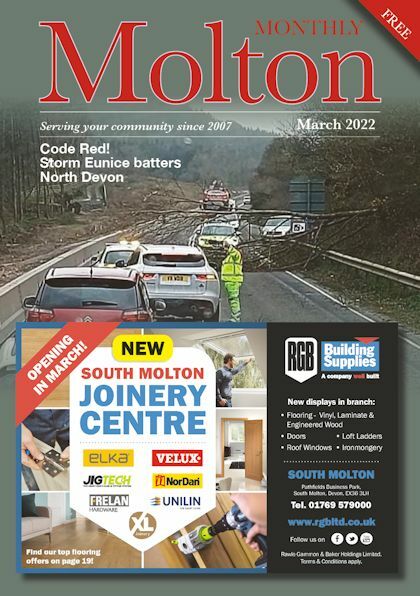 All material published by Molton Monthly either in the magazine and/or online, including adverts, editorials, articles and all other content is subject to our terms and conditions. 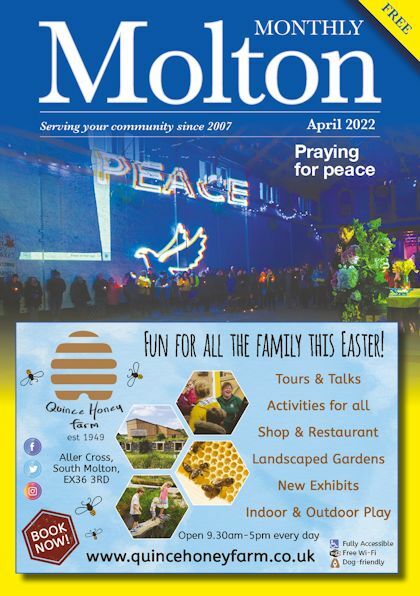 All material published in Molton Monthly either in the magazine and/or online, including adverts, editorials, articles and all other content is published in good faith. However, we accept no liability for any errors or omissions and we do not endorse any companies, products or services that appear in the publication or online. All material is accepted on the understanding that it is copyright free. Molton Monthly accepts no liability for any subsequent copyright issues, and cannot accept responsibility for and does not endorse views expressed by contributors. Molton Monthly does not accept responsibility for the accuracy of claims made by advertisers. No part of the magazine or online material may be reproduced without the prior written consent of Molton Monthly. © 2018 Molton Monthly. All rights reserved.